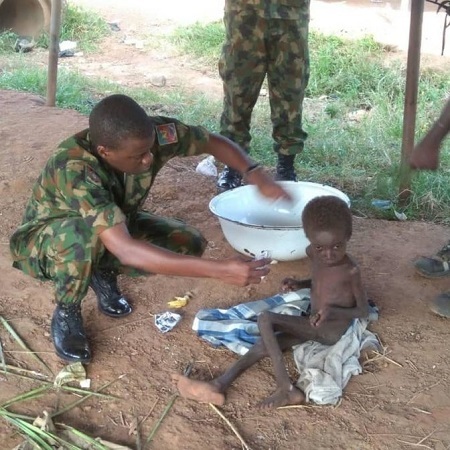 During the search and rescue of a soldier identified as L/Cpl Oluwabukunmi Fadoju, who got missing since 17 September 2018, a little abandoned and malnourished child was saved by soldiers in Ebonyi state. 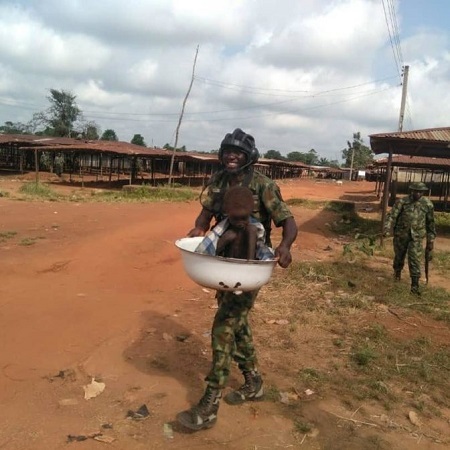 According to reports, troops of 24 Support Engineer Regiment Abakaliki got to Onunwakpu market in Izzi area of Ebonyi State on 16 November 2018. They discovered a malnourished child locked up in a house. The child was seated under a charm, picking leaves from ground to eat. Consequently, the troops burnt the charms, gave him some banana and biscuits to eat, and thereafter, took him to Medical Reception Station for treatment. The child was subsequently handed over to Ebonyi State Government.